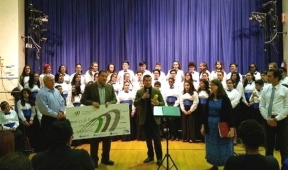 The Lincoln Middle School Choir was awarded a philanthropic grant from the Berwyn Development Corporation (BDC) to help fund their choir trip to the America Sings! Festival in Washington, DC. The Berwyn Development Corporation provides charitable contributions to causes within the Berwyn community. The BDC makes awards to local not-for-profit public charities, giving priority to those efforts that positively impact economic vitality, provide services directly to beneficiaries, address root problems and serve disenfranchised groups. Berwyn headquartered not-for-profits can make application for funding throughout the year as needs arise with awards based upon available BDC funding. For more details regarding the philanthropic program, call the BDC at 708-788-8100. (From left to right) BDC Board members Tom Benson, Guy Hollis and Jousef Mondragon presented a philanthropic grant to the Lincoln Middle School Choir on May 5.